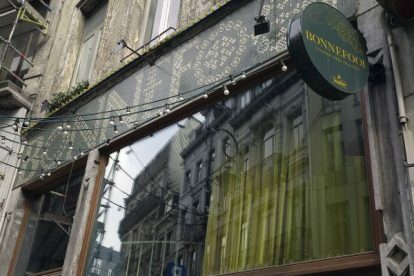 At Bonnefooi you can see a concert every day for free. They have blue painted walls with luxurious lighting and a matching coffee and tea set, served with a chocotof. Long bar with a piano at the entrance. A stairway makes way to another floor with tables that offer a birds eye view of the bar. Kitsch design in the bathroom and portraying some animals. Good venue where it’s nice to be. Great for music jams, concerts, dancing and experiencing Brussels active young people. Opens at five ‘clock. There is usually more activity during the week. I like the fact that it has made a name for itself in such a short time. Out of nothing this place emerged and in a few months they’ve succeeded in converting their street into a ‘music street’ with regular vinyl and other music related sales in front of the place. I like sitting at their terrace and enjoying the musical performances. I also enjoy the general positive intention of the place which must be something like bringing musicians together to make great things happen. To create a new dynamic and give Brussels a much needed revitalising therapy.